Reduced system costs, increasing electricity rates and incentives are bringing new solar customers into the market in greater numbers than ever before. Unlike early adopters who chose to go solar because of environmental concerns, or a desire to reduce their reliance on the electric power grid current shoppers are motivated by pure economics of switching to solar power. shoppers some installation companies offer solar leases. Under this model, the solar company installs a PV system and pay the property owner a fixed price rent to their roof and keep the income / saving for the duration of the agreement. These companies’ aggressive advertising of solar leases created an artificial upsurge in demand for leases and many homeowners were led to believe that system ownership was cost-prohibitive. Can going green by leasing solar panels for your roof cost you money — or give you headaches — when you go to sell the house? Possibly both. Say you get pitched by one of the companies offering solar panels at no upfront cost and they will pay you money annually. Sounds like a good deal and you sign on. Then a few years later you decide to sell the house. You assume that the presence of solar panels can only be a marketing plus, maybe even get you a higher price. Some would-be buyers won’t sign a contract unless you buy out the remaining lease term with solar company which would cost more than if you had initially purchased it. Issues like these are popping up increasingly and are interfering in sales and closings of real estate sales, according to US real estate industry experts. Be aware of the potential complexities that can occur when you lease, rather than buying solar panels. If you opt for a lease, understand your long-term obligations. The $0-down solar loan makes it possible for homeowners to capture more of their solar energy system’s value, and provides a route to system ownership for those that cannot afford a cash purchase. Homeowners with access to loan can save significantly more over their system’s lifetime than if they entered into a lease agreement. Multiple studies have shown that solar system ownership means better home value. 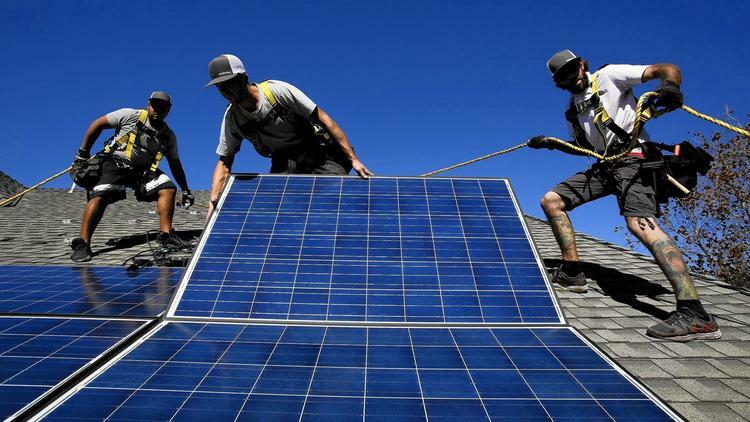 In addition studies have also found that installing a PV system on a home increases property values and only if the system is owned, rather than leased.